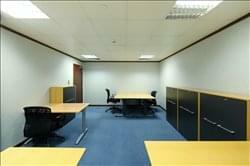 Considering a Serviced Office in Abu Dhabi? Located to the south-east of the Arabian Peninsula in the Middle East, Abu Dhabi is the capital and the second largest city of the United Arab Emirates. Because of its large oil and gas reserves the city has one of the highest GDP’s per capita in the world. Since 2009, the UAE has been diversifying its economy, investing in sectors such as real estate, retail, tourism and industry. This is causing more and more businesses to rent serviced offices in Abu Dhabi. The city is well-developed and boasts a multiethnic population made up of expatriate workers from India, Bangladesh, Pakistan, Somalia, Philippines, Sri Lanka and the United Kingdom. In addition to numerous work-life amenities, Abu Dhabi is also home to the Capital Gate Tower (the world’s furthest leaning man-made tower) and Ferrari World (the Middle East’s leading tourist attraction). Compared to neighbouring Dubai, serviced offices in Abu Dhabi can be acquired at much more cost effective rates. Cars are the main mode of transport in the city. The roads are well-developed and connect Abu Dhabi to various cities in the UAE. The most notable amongst these is the Dubai-Abu Dhabi Highway which was constructed in 1980 and connects the two cities. Companies with serviced offices in Abu Dhabi can benefit from the excellent public transport system operating in the city which consists of both taxis and buses, but of which offer great value for money. The city also has access to two international airports. These airports are situated along the same road and cater to both local and international flights. Find My Workspace lists over 95% of the serviced offices market in Abu Dhabi. Simply click Request Quote to check pricing for one office, or Add to Basket for multiple offices. This business centre is located in the heart of Abu Dhabi’s central business district, in the ADGM. The centre has serviced, coworking and virtual options and is within an A-Free zone. The centre is full of light and gives great views across the Al Maryah Island. The offices are spacious with a marble floored lobby that will impress any of your business guests. 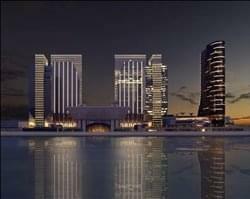 Located in the heart of Abu Dhabi’s central business district, the ADGM square business centre on Al Maryah Island occupies a spectacular mixed-use waterfront development. This centre has a spectacular lobby with marble floors and views that reach out across the Island. With a choice of collaborative workspace and private office space this centre is great to suit a multitude of business types and needs. This brand new Grade A office building is located in the landmark area of Sowwah Square next to the Galleria Shopping Mall & Rosewood Hotel and provides modern offices ready to use for short & long term. The centre occupies the 24th floor of the building with breathtaking views of the Arabian Gulf. Individual offices can accommodate from 1 to 6 people, boardroom, conference rooms, high speed Internet, multilingual staff, café, fully secured building and parking available. 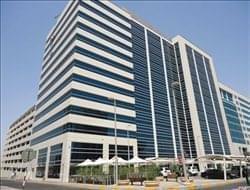 This business centre provides a range of ready to use offices, good facilities, and smart meeting room to rent in Abu Dhabi, U.A.E, which are ideal for people who are in the early stages of their business and who will benefit from a secure and supportive environment in which to develop their business successfully. These facilities are in a prestigious business address, with fully furnished offices, reception service /waiting lounge Access, and awesome interior / Quality furniture. Enjoy the daily mail service, service of someone answering your company calls / sending notes, broad and standard meeting room, and 24 /7 on-site, over the phone help desk support and many more inclusive services. A brand-new building offering a stress-free business environment in proximity to city centers, major banks and transportation links. This center can be tailored to suit your business needs. From day one you can lease the space your company requires, and occupy it for the most appropriate period. Flexible leases, flexible payments, efficient support team, state of the art IT, prime location. 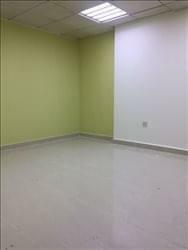 This centre, located in a prominent area of Abu Dhabi, offers fully fitted office space. With reception and IT services, this centre will ensure that you are able to operate your business as efficiently as possible. Other amenities include fully furnished workspace solutions, 24-hour access/security for your convenience, public parking and kitchen with refreshments. You can stay well connected with international and local clients with fantastic telephone lines, high speed internet and meeting rooms. The friendly on-site administration team will help you manage your business, and the options for videoconferencing will allow your collaborative projects run as smoothly as possible. This centre occupies six floors from the mezzanine to the fifth floor where clients can enjoy 71 first-class ready-to-use offices, high-speed secure Internet access, three fully furnished and equipped meeting and interview rooms, a state-of-the-art videoconferencing studio and business lounge for mobile workers. All of it expertly supported by a multilingual team of on-site professionals. This business centre provides serviced offices , ready to move in. The rent includes the utilities such as (water & electricity), AC, Internet, telephone and office cleaning. 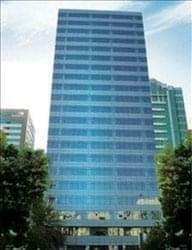 All offices are furnished, and underground parking is provided for clients. Also available is administrative support such as typing, faxing, copying etc. A virtual office option is also available from the address of the centre to telephone answering. 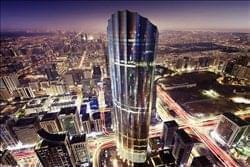 A new and modern building in the flourishing and attractive business climate in Abu Dhabi. The offices are fully furnished with modern stylish desks and equipped with leading-edge of technology and clear communication facilities (cisco technologies). Meeting room is equipped with presentation tools and materials. Business lounge is ready to serve you beverages. Setting up a company will never be a hassle again. All your worries associated with contracts, long term obligations, designing office spaces, furniture and supplies, dealing with infrastructure, utilities and other needed services related to putting up your business are a thing of the past. This centre will minimise your business costs and provide you with professional workspace in the best business locations in the country – Dubai and Abu Dhabi. The centre offers perfect fully equipped office space to accommodate all your business needs. The premises are close to all amenities, easily accessible to clients and most importantly with flexible terms and conditions. This business centre provides contemporary short-term offices in a centrally located new building with ample free parking. Excellent services and facilities include: office suites ranging in size to accommodate 1 to 6 persons, executive meeting and conference rooms, high-speed Internet connection, professional multilingual staff, car with driver, fully equipped kitchen and business lounge, new modern office furniture and no set-up or exit fees. This business centre can assist with leasing staff accommodation, buying or leasing permanent offices, relocation assistance and travel concierge services. New executive centre consisting of16 floors, located in the heart of Abu Dhabi centre. Outstanding services and facilities include fully furnished offices, meeting and conference rooms, state-of-the-art Internet and network access, 24-hour security and access. This space provides beautifully designed workspace at affordable prices. This center brings Silicon Valley style & culture to the UAE and provides bespoke, highly efficient, modern workspace coupled with top of the line IT infrastructure. It will also support your business with community management, special Members Only networking events, PR & marketing support, social media support, and educational programming, along with access to a deep pool of mentors representing global industries across sectors. 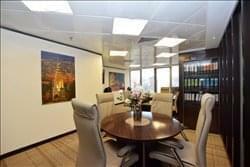 This is the only community managed and curated serviced workspace in the UAE. All offices are Tawtheeq / DED Trade License approved. Tawtheeq can be issued in 72 hours. 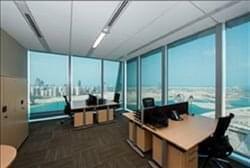 This stunning business centre located on the 23rd floor has amazing water views of Abu Dhabi. Fully serviced offices come fully furnished with a contemporary style, designed to promote productivity and maintain a chilled-out atmosphere. This space is tastefully designed with elegant and sophistication. At this outstanding business centre, the quality amenities provided include a fully equipped kitchen to make your lunch, tea and coffee breaks as convenient as possible, and providing a space in which you can recharge. In-house catering is available, making your meetings and conferences as easy and hassle-free as possible. Located in the heart of Abu Dhabi’s central business district, this centre on Al Maryah Island occupies a spectacular mixed-use waterfront development. Accessed from landscaped public areas and a promenade, the flag building is sure to impress, from its spacious and bright marble-lined lobby to the views from the light-filled column-free workspace. Businesses in and around this high-quality building include the Abu Dhabi Securities Exchange and a mix of global companies including many in the financial services, law, property, and oil & gas sectors. This location in Tamouh Tower in the City of Lights offers you a business centre with a high profile, plenty of entertainment and leisure facilities. Fantastic views of Al Reem Island, Abu Dhabi and the Marina allow you to work with elegance. You can choose from a range of offices including fully serviced window or interior offices, office suites with attached meeting rooms and co-working spaces with hot desking available. Pricing comes all-inclusive, meaning you will not be caught out with any hidden fees at the end of the month. By scaling up as you need you won’t pay for more office space than you need, and your work space can grow alongside your business. Further amenities include access to global business lounges, full administrative support from an on-site management team, such as mail handling, printing facilities and call answering. Secure and high speed WiFi ensures you can work as quickly as possible, with 50 million hot spots also available world wide. This great space provides beautifully designed workspace at affordable prices. This center brings Silicon Valley style & culture to the UAE and provides bespoke, highly efficient, modern workspace coupled with top of the line IT infrastructure. The centre also supports your business with community management, special members only networking events, PR & marketing support, social media support, and educational programming, along with access to a deep pool of mentors representing global industries across sectors. The business centre itself is accessible 24 hours day and offers secure on-site parking. 5 Star serviced offices located on the 17th floor of a prominent building in Abu Dhabi, offering stunning views of the Abu Dhabi corniche and the Arabian Sea. This centre is an A-grade building centrally located on Hamdan Street in the heart of the UAE’s capital, Abu Dhabi, with direct access to The WTC Mall and Courtyard by Marriott hotel. This development was designed by world-renowned architects Foster & Partners featuring modern amenities in a luxurious environment. The tower’s central location, state-of-the-art facilities, 24 hour security and comprehensive range of amenities is built to cater to every possible need that a business might have. To obtain information for your selected Abu Dhabi Serviced Offices, please tick the "Add to basket" box for each office you prefer and complete the form below. We will then send a detailed report via email.